Lunch box….. The big question always is what do I pack today for lunch? Whether it is packing lunch for your own self or for your kid is a perennial challenge. By the time noon rolls in, it is very easy for us to head to the nearest eatery. Constant splurging of money on restaurant food which we can make at home for lesser costs and healthier too ends up as a tedious task apart from getting boring. How can one keep their lunch tasting good day after day? How can one have mouth watering food and stick to their diet too? How can one be hero of their kids by winning their hearts with innovative and yet healthy recipes? Here are 10 healthy lunch ideas, where health meets ease, losing weight become interesting and kids will love you for having new meals in their tiffin box everyday!! The simplest meal, one can ever make. Nutrition packed between two slices of bread, make sandwich a wholesome meal. One can make sandwich a complete meal by adding various elements to it. Veggies of your choice will give you ample of fibre and protein can be derived by adding grilled chicken or scrambled or poached egg to it. Vegetarians can opt for cottage cheese for their protein quota! Wraps too are good option, when we are running out of time. One can make a wrap healthy by opting for healthier base like wheat base or ragi or multi grain base. When one thinks about salads and to most of us, salad is one of the most boring foods treated as side dish. But, if some dash of creativity is added to it, then a salad can be one of the most interesting and a wholesome meal! Various experiments can be done with the salad, especially with the veggies in it. One can stick to classic salads, made of carrots, cucumber, onion, tomato. Or can go exotic by adding vegetables like broccoli, red cabbbage, zuccini, mushrooms, cherry tomotoes, baby spinach, avacado etc. One can always make it interesting by adding a zest to it with salad dressings. But, be cautious here as it can be fattening too, if mayonniese is added. One can make it a whole meal by adding cottage cheese, grilled chicken, poached or boiled eggs to the salad. South Indian style meal can never go out of fashion! It is one of healthy and quick meal to prepare and is favourite of every second Indian! Stick to the classic choice of white idli, paper dosa, masala dosa, rava dosa or one can opt for healthier verisons of the dosas and Idli’s!! Instead of classic rice and urad dal combination, one can have idli or dosa made of ragi or oats. One can make it colorful by adding different veggies to it or simply can add a paste of spinach or dill leaves to the batter. Don’t forget to have a sambar by your side, as it is your protein dose which should be taken with the main meal! Looking for something piping hot to moisten your throat? What can be the better option than the soup!! Soup is always considered as a starter. But, now this starter can also be taken as a main course, if made healthy changes to it! Classic soup can be given a wholesome twist by adding fresh vegetables to it. To get the more nutrition, one can change the trend of having clear broth and go for thicker soup instead. But, beware of those packed soup. It is best to avoid them, as preservatives is been used and to get the thicker consistency, corn starch is generally added to the soup. Yet another easy, quick and healthy option we can have on our platter for lunch. One can make stuffed parathas, more full of fibre and rich in protein by adding vegetables and cottage cheese to it. Give a miss to a classic Aloo paratha this time, and make parathas more tempting and healthy by adding vegetables like carrot, peas, cauliflower, brinjal, cabbege etc. One can combine methi or palak theplas with thick curd to make a healthy and balanced meal. If you have some time to use little imagination, then here are few quickies for you. Most of us are aware of Quinoa by now. How about having this high on protein meal for our lunch? We can make this cereal healthy and wholesome by throwing in some vegetables to it. Same can be applied to Daliya (broken wheat) as well as for red and brown rice. Veggies will add fibre to it and cottage cheese or chicken or egg piece or even curd aside to suffice the protein requirement of the lunch. Not necessary it has to be packed or home cooked for us every day for lunch. There will be days, when we have a party thrown by an office colleague, or you are the one who is giving the party or sometimes, we can be in no mood to cook food for ourselves and wishing to simply eat out!! Start your meals with some sumptuous healthy starters like grilled or tandoor chicken or fish platter, Paneer and baby corn tikka or order for a Mediterranean platter that contains hummus and pita bread. Sizzlers could also be a good option to start your meals with. Order varieties of starters so that your stomach will be half filled with the starter and will have less place for typical Indian main course meal. Let’s face it. It is a universal question for every mom who prepares a lunch box for their kids!! What new and healthy can be packed which balances taste and the nutrition. We can pack everything from sandwich to wraps to bread omlete to parartha or even muffins and pastries! Make sure we add some quirky twist to their meals which will simply WOW them and make them finish the entire tiffin!! 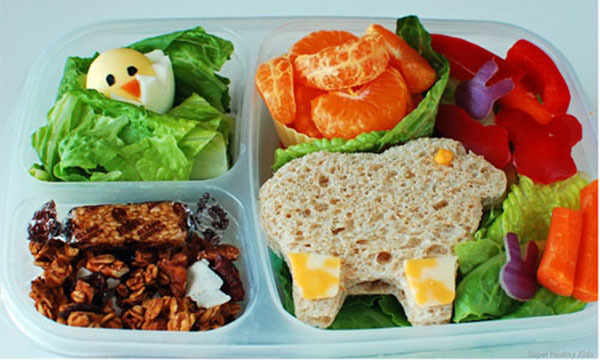 Apply ideas like making cartoon faces over sandwich or paratha by using eggs, olives, carrots etc. Use the not-so-favorite-vegetable of your kids in such way, that they will unknowingly or consciously make an effort to eat it. But, also keep in mind, that their meals should consist of each major element like carbs and protein, in ample amounts. 9) Something for calorie watchers too! “I am on diet, I can’t have tasty food”. Say bye bye to this thought and make your lunch sumptuous by adding zest to it. Give classic recipes a healthy twist by adding your own ideas. Heard of vegetable smoothies? Go wild over your ideas by adding your fav vegetable to the mixer and blend it to a thicker juice. Don’t go for straining and you can drink your vegetables!! One can always stick to salads, soups etc. But, you can make the boring weight loss interesting by making the meals interesting with new ideas! Nothing can replace classic dal chawal thali to any continental meal!! It has everything, right from carbs (rice) to protein (dal) to Vegetables (fibre) to chapati (complex carbs). Our typical Indian thali is actually a wholesome meal. Rather than going gung-ho about eating rice, we simply can enjoy rice by watching our portions. Make sure your vegetables are tossed in least amount of oil. No extra oil goes on chapati. If we keep these things in our mind then we are sorted. I think I have shared enough of options with you to be a hero of your family! So, go ahead and indulge in some of the most delicious yet healthy food!